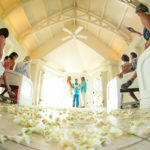 This wedding was held at St. Peters catholic church in Kona, on the Big Island of Hawaii. St Peters is a cute blue church right on the ocean. It is a great location, but is for smaller weddings in that there are only so many seats inside. The church can get warm and I would recommend a morning wedding over a wedding in the afternoon. 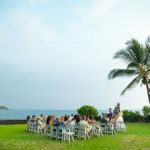 The couple got ready at the Kona Sheraton as well as had their reception there on the lawn. During the reception the bride did a special hula for her husband. The resort had a dance floor put onto the lawn.